When I go to the vet, I have some things I do to make the visit as successful for everyone as I can. I try and take into account my dog’s needs, the needs of the animals I will encounter, the needs of the other clients of the veterinary hospital, the doctors, the techs, the receptionist and of course me. The last time I was at the vet (last week) there was a lovely bulldog cross in the lobby barking and lunging at me. “He just wants to say hi” his owner said. I looked at the dog who most definately did NOT want to say hi, and said to the owner “be that as it may, he is being very rude and I am not going to greet a dog who is behaving that way.” Then I shifted two seats over and out of reach, and started to think about how I go about making vet visits successful for my dogs. Where was my dog? Safely in the car where the snarling bulldog couldn’t make him uncomfortable. I am not perfect by any stretch of the imagination, but I do make an effort to make the vet visit as safe and stress free for everyone as I can. I start out by understanding that there are many people to take into account when considering how to make a vet visit successful. Each of those people and all the pets involved have a different role to play and have different needs to be met. I like to start out with me and my dog. I have three dogs. Eco can be quite reactive and he is very predatory to cats. As a service dog, D’fer has been everywhere and done everything. Friday is not reactive, but she doesn’t have the level of experience that D’fer does. The first thing I do is to take into account the needs my dogs have. When I arrive, I go in and let the receptionist know that I am there, and I take a look around the waiting room. If it is really busy, then I sit down until it is my turn. Unless it is an emergency, my dogs will be more comfortable and relaxed in their crates in the car than they will be in a waiting room. If your dog won’t wait in the car for a few minutes teach him how to do this. If it is hot where you are, consider bringing a second person with you to sit with your dog with the car doors open during the wait. My current vehicle has a hatchback opening and I will often leave my dogs in their crates with the hatch back open and a battery operated fan to keep them cool in hot weather. Let’s be honest; veterinary waiting rooms can be very difficult for pets, especially if they aren’t feeling well. By coming in, checking in with the receptionist and then waiting our turn, I decrease the population pressure on what is often a really small space that is not well designed for the animals who end up waiting there. If I could redesign veterinary waiting rooms, I would make small stalls with a chair and a gate so that the person and the pet can be contained without meeting every other pet in the universe. The other thing I would do would be to have an IN door and an OUT door that didn’t require pets to pass one another. And the final thing that I would do would be to set up appointments so that you don’t have large dogs and small pets confined in the same place! I really worry about Eco someday being faced with a tiny dog or cat and having an undesired outcome. He would not need to be aggressive in order to cause harm to such a pet; he would just have to trip on them to hurt them. Given that I am not in charge of veterinary waiting rooms, I need to preplan and train for success, and that is just what I do. When I do come in, I choose what equipment I want to use with care. Usually, when I bring Eco to the vet, we use a head halter so that I can control his head. That way if there is a dog in the room who is staring at him, I can physically turn his head away from the dog who is staring at him and head off any reactivity. With D’fer and Friday, I usually use a flat buckle collar, but I still choose my route through the waiting room so that if a dog stares at either of them, they won’t feel threatened. This is a really great reason to teach your dog to walk on either side of you; putting yourself between your dog and a dog who is staring at him can really go a long way to helping your dog to feel confident about the trip through the waiting room. Next stop is usually the scale. It is really easy to teach a dog to get on a scale and it is worth the time to teach them how to do that. 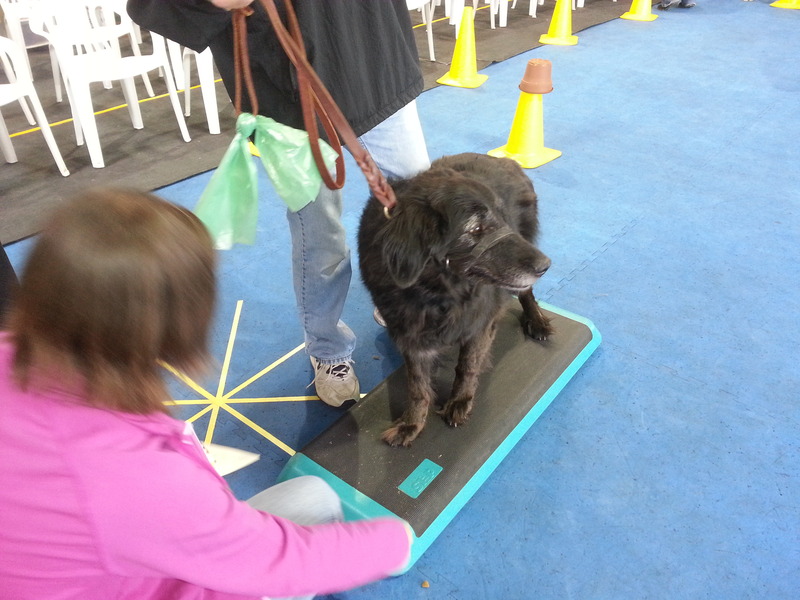 I use an aerobics step in my training classes to teach dogs to get on the scale and then to stay there long enough to register their weight. Training this behaviour is fast, easy and fun to do at home, and incredibly useful. If you are spending ten minutes struggling with your dog to get him to stand on the scale, you are often going to be taking up time from the receptionist or the tech or the vet. If your dog finds getting on the scale frightening, you are setting him up to be anxious and upset when he goes into the exam room. This is especially important when you have a large or giant breed of dog. Practice at home and then it is easy to do at the vet’s and it helps to get you in and out of the waiting room in a hurry. Once you are in the exam room, either engage with your dog in some way, or ask him to lie down and stay. D’fer has to go into the vet’s fairly frequently to get laser and cartrophen treatments. When we get into the exam room, if we have to wait, I usually use that time to play some quiet clicker games; shaping head posture or playing the what else game (where he gets clicks for doing things that he hasn’t done in that particular chain) or even fetching named items. With Friday and Eco, they aren’t going on a regular basis, and they aren’t as often in pain when they go, so they get to do a down stay; we don’t usually have to wait more than five minutes so I don’t feel this is an unreasonable thing to ask them to do. Teach your dogs to do at least a ten minute down stay and your vet visits will be much calmer and more relaxed and frankly easier for everyone. 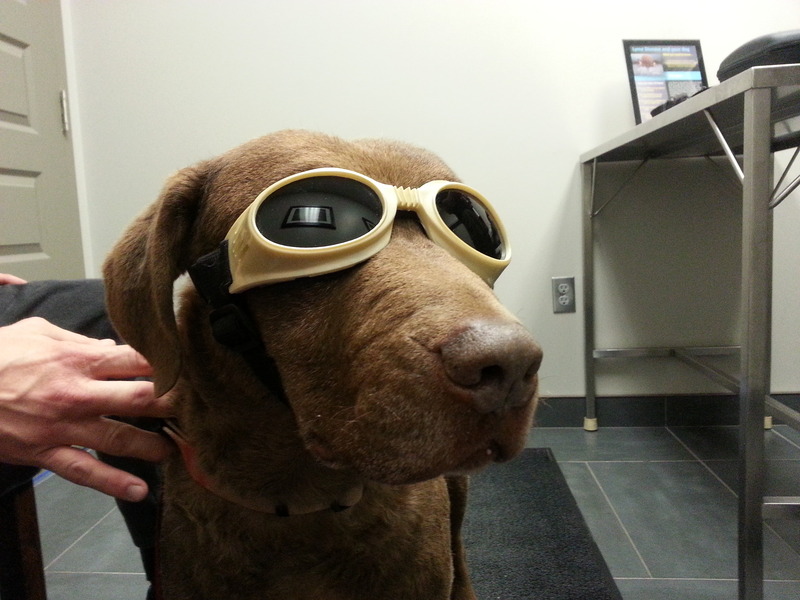 All my dogs are taught to wear muzzles and I bring the right one to each vet visit. If the vet needs to do something that might cause my dogs pain, I will offer to muzzle them. Being willing to muzzle my dog and having a dog who will wear a muzzle without a fuss makes my vet’s job safer and that makes it more likely that my vet will be able to handle and treat my dog in such a way that he will get the best medical care possible. I also spend time ahead of the visit teaching my dog that being handled and lifted and shifted and examined is a sae activity. When a vet is spending more of his or her energy restraining the dog than examining him, they cannot get the best information to help your dog. If your dog doesn’t like being handled, then work on it! Help your dog out; if he is struggling and trying to escape he is more distressed than he should be. Start simply and grab your dog’s collar and feed. More bites happen when a dog is having his collar grabbed than nearly any other time in a vet clinic. Then start doing a mock vet examination; it doesn’t have to be exactly like the vets do; in fact if you are clumsy and a little inaccurate then you are preparing your dog for the day that the vet mishandles your dog. It won’t be scary for your dog if you have done the background work on teaching him to accept being handled. During the exam, your vet may need to do a procedure such as putting eye drops in your dog’s eyes or looking in his ears to see if there is an infection. Once, D’fer had a stick caught between his upper molars and the vet had to open his mouth and stick a giant set of scissor like forceps in there and yank it out! Amazingly, although I had never done this to Deef before, he sat still for the procedure and it was over before I knew it. This was a successful procedure in part because I have done nearly everything else to this dog before we did this and he just thought this was yet another variation on handling games. 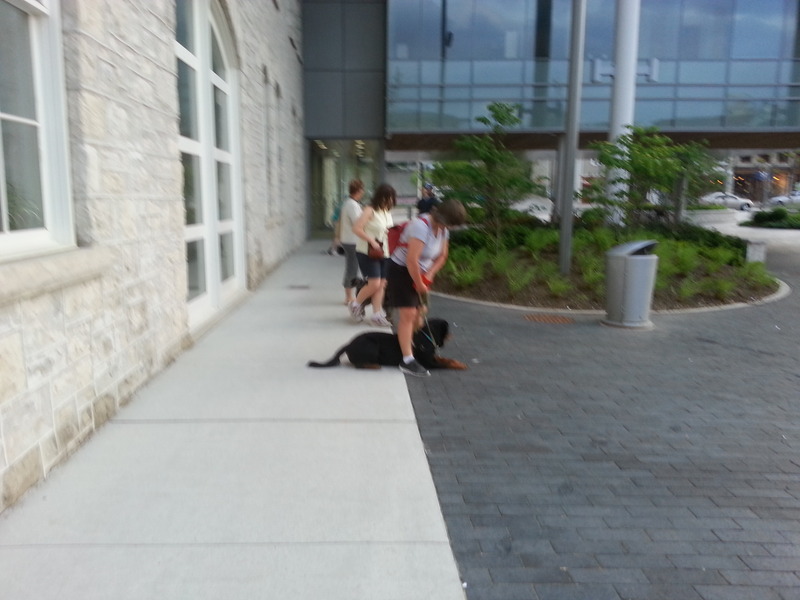 Once the examination is over, you have to get your dog out of the exam room and back into your car. I will often put my dog back in the car before settling up the bill but if I DO have to keep him with me for whatever reason, I ask him to lie down and stay with his back against the counter of the clinic reception desk and my feet between him and the waiting room. I am very careful about my dog’s behaviour in waiting rooms but I don’t expect that every owner will be as careful as I am, so I take steps to ensure that my dog will be safe right through to the end of my visit to the vet’s office. As you are leaving the office, keep an eye out for new folks coming into the office with their pets. Often I have taken a step back to allow someone else to come in so that we don’t tangle the dogs with one another in a confined space. I like to think about my dog as moving through the world in a giant safe bubble with me. If I could invent a giant gerbil ball for my dog, then that would keep us safe from all the things that can potentially make a vet visit possible, but until that day comes, I will keep relying upon management, preplanning and training to make things successful when I visit the vet. I just wish I could have had that gerbil ball for the bulldog cross who just wanted to say hi when I was at the vet’s!